Researchers at Georgia State University’s School of Public Health are partnering with the American Cancer Society (ACS) on a project to help colleges and universities across the United States develop and implement tobacco-free policies. “Tobacco use still cuts too many lives short and causes serious health problems that burden individuals and society as a whole,” said Dr. Michael Eriksen, dean of the School of Public Health. ACS started the Tobacco-free Generation Campus Initiative (TFGCI) in 2016 with funds from the CVS Health Foundation to help 120 colleges and universities advocate for, adopt and implement 100 percent smoke- and tobacco-free campus policies. ACS estimates that of the 20 million college and university students in the country, 1 million will die prematurely due to smoking. Cigarette smoking remains responsible for nearly a third of all cancer deaths in the nation, and 99 percent of smokers take up the habit by the age of 26, making college campuses an ideal target for efforts to curb tobacco use, according to the ACS website for the initiative. “We look forward to helping the American Cancer Society and participating universities in creating a tobacco-free generation of young people,” said Dr. Michael Eriksen, dean of the School of Public Health and an internationally recognized expert in tobacco control. 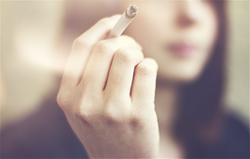 Researchers Pamela Redmon and Amelia Jazwa will evaluate the effectiveness of the Tobacco-free Generation Campus Initiative by assessing tobacco use on participating campuses, the intentions to quit among students who use tobacco products, perceptions of anti-tobacco policies and their enforcement, among other issues. The work is designed to help ACS gauge progress on participating campuses. For the first two cohorts of the program, ACS selected 64 campuses ranging from community colleges to major research universities such as the University of Michigan and Penn State University. The campuses serve more than 950,000 students across 27 states.